How Sad are these Book Stats? How sad is this? The Twilight Saga has been read millions of times more than Gone With the Wind (one of my fave books) and the Diary of Anne Frank. And this is really only keeping track of how many copies have been sold, not the amount of times its been borrowed from the library or friends, or digitally(?). 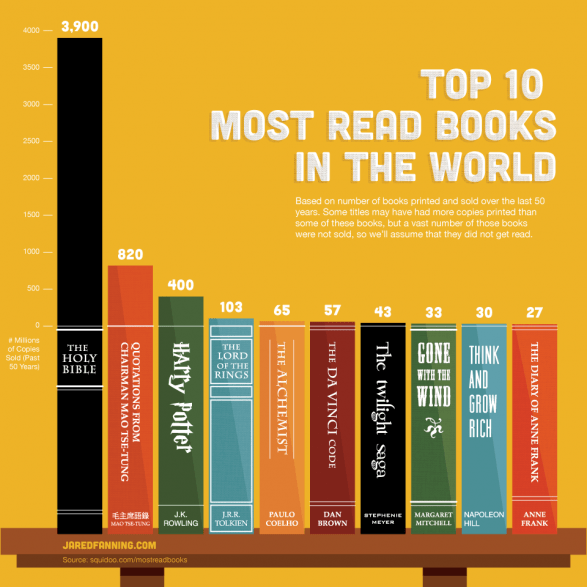 Top 10 Most Read Books in the World infographic by Jared. This entry was posted in Books and tagged anne frank, bible, books, diary of anne frank, gone with the wind, harry potter, infographic, literature, top 10 most read books in the world, twilight saga on March 26, 2013 by christinapertz1.